My encounters with risotto have been few and far between, but each has been magnificent. There was the one I ate the last time I was in Italy, definitely not vegan but definitely delicious. And then there was the sublime Sweet Pea Risotto I had at Karyn’s on Green this past August when S and I were in Chicago for a weekend. I still think about that dish every so often, sighing gently as I recall its delicate flavor and creamy texture. But, despite my thus far excellent encounters with risotto, I’ve never made it myself. Having read anecdotes that made risotto-cooking out to be a behemoth of a task, a David vs. Goliath-esque challenge, I feared that I’d somehow bungle it up and mar my otherwise perfect relationship with the dish. So it was with a mix of excitement and trepidation that I discovered a recipe for Carnival Squash Risotto just as I was beginning to fear that the aging carnival squash on my dining room table was withering on the inside, secretly rotting while its outsides remained colorful and bright. But because MoFo is a time for pushing your cooking comfort zone, I decided to try the recipe, and I’m very glad I did! This was seriously so much easier to make than expected. Sure, I had pay close attention to my rice, but it only took a half hour of intermittent stirring, not the hour of intense labor I’d imagined. And the results were fantastic. I used Imagine’s No Chicken broth instead of my usual powder-based broth, and I think it made a difference – the rice was incredibly flavorful and – dare I say it? – creamy. I loved the little bits of squash that didn’t quite meld into the dish, but I do think the dried oregano and basil were both a little strong – they nearly overwhelmed the squash’s flavor. The fresh basil on top was a great touch, although the roasted squash seeds were more for appearance than anything – carnival squash seeds are a little too small to be worth roasting. Overall, though, this was a smashing success, and I’m happy that my third risotto encounter was a positive one, just like the first two. 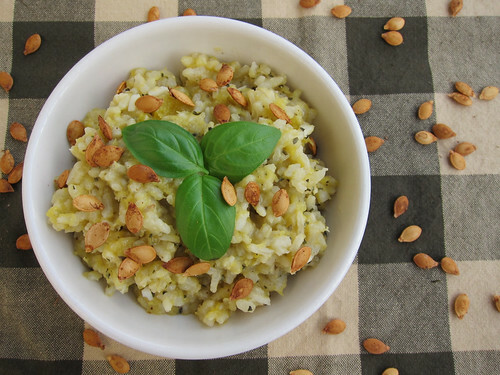 What kind of risotto have you made? What cooking techniques scare (or scared!) you? Oh my goodness! I’m so glad you liked it! And I hope you had a fantastic time in Italy! !